This 10x8 Helios Summer house is a guaranteed market leader due to its beautiful contemporary design and will be a key element of all garden fun this summer and for summers to come. The tongue and groove cladding ensures that it has the maximum strength capabilities and is long lasting. The roof on this 10x8 Helios Summer house consists of tongue and groove boards and has been curved to allow for simple water run off. This means that the roof is immune to damage from rot due to water collecting. The wide double opening doors open up to allow access inside but also opens up the summer house for when you have family gatherings. The Windows on this 10x8 Helios Summer house are made from a glass alternative called styrene, chosen for its anti–shatter properties. This summerhouse features a lock and key mechanism which adds security to your belongings and allows you to furnish the interior without worry from intruders or damage. 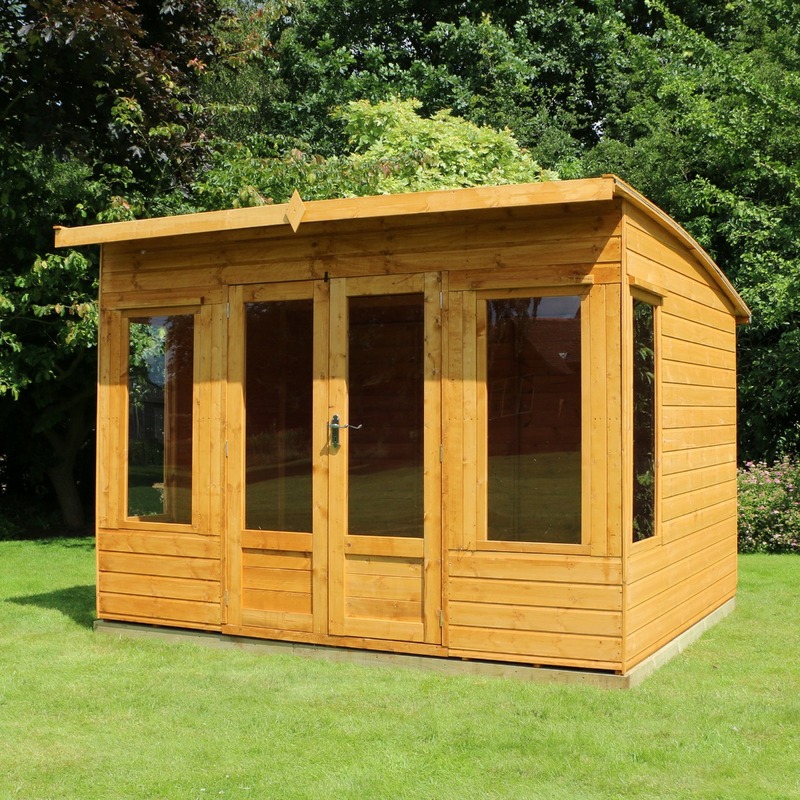 This 10x8 Helios summer house boasts a 10 year anti–rot promise and to gain this fully we advise you treat the summer house annually with a timber preservative.Simple instructions mean that assembly does not take up much time and once built will offer great value for money. A contemporary designed summer house with an elegant curved roof which allows for efficient water run off. The 12mm tongue and groove cladding, flooring and roof creates a super sturdy build. Wide opening glazed double doors allow easy access in and out of this summer house and can be secured using lock and key. Four windows and the glazed doors provide plenty of light into the summer house and are glazed with styrene.